To utilize integrated pest management methods to promote healthy forests. To provide accurate information on the health of Nova Scotia's forests and give information and management options to forest stakeholders. Forest Health is a section within the Forest Protection Division, Nova Scotia Department of Natural Resources. Forest Health has offices and a lab facility (the Insectary) in Shubenacadie. To monitor forest pests and develop better detection methods. Analyse forest health conditions using field and survey data. To provide accurate information and education to forest stakeholders in a timely manner. To develop and maintain management options and systems. 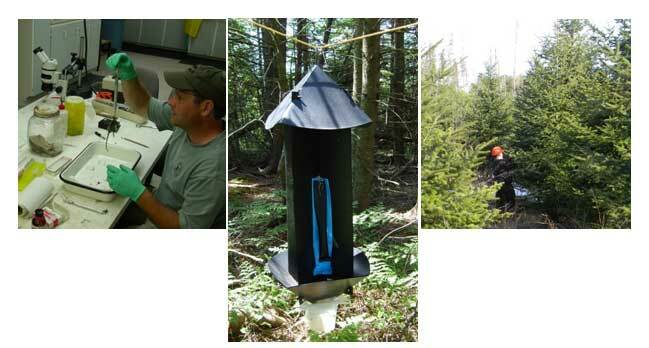 There are a number of insect pests that affect the forests of Nova Scotia. The protection of this valuable resource depends on early detection and assessment of these problems so that action can be taken quickly and effectively. In the event of a large-scale control program for a forest pest, Forest Health supervises the program and provides expert technical advice and quality control.